The actor rocked a printed dress on the cover of Viva L'Amore. 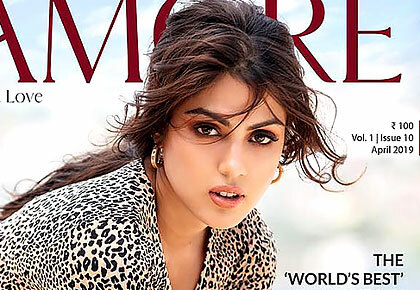 Fierce and dramatic, prepare to fall in love with Rhea Chakraborty. The actor followed her animal instincts as she sizzles on the April 2019 issue ofViva L'Amore. Dressed in an animal print dress and her hair worn in an unkempt fashion, she unleashed her wild side on the cover. Flaunting her toned legs, Rhea completed the look with ankle-length boots. Sporting minimal make up, she looked effortlessly stylish and chic. Styled by Suresh Menon, the cover has been photographed by Mobin Kurien.